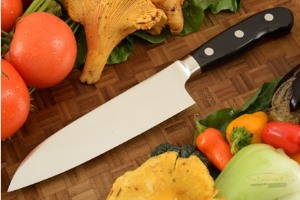 Saya (sheath) for Chef's Knife - Santoku - 180mm - 7-1/8 in. Cutting edge length: 6.75 in. 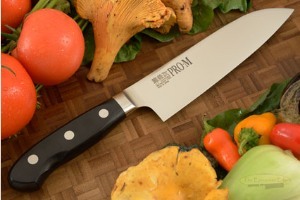 Description: Pro-M is a perfect knife for either the home or professional chef. It provides a superior, keen edge that just won't quit. Pro-M is made by Seki-Kanetsugu Hamono, founded by the legendary Seki swordsmith (Kanetsugu) from the Teiwa period (1345-1349). The ancient techniques of forging samurai swords have been passed down from generation to generation for over 660 years. The Pro-M blade is a high carbon, high molybdenum, high vanadium stainless steel. It is heat treated to Hrc 57 and sub-zero quenched for longer edge holding and resistance to chipping and brittleness. The blade is convex ground (hamaguri-ba). 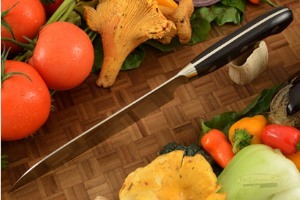 This helps food release from the side of the knife while slicing. The edge is sharpened to 15 degrees on each side. The black pakkawood handle is nicely rounded for a secure, comfortable grip. It is slightly larger than many Japanese knives. 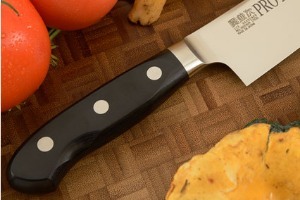 The handle is triple riveted to the tang. Following in the best tradition of knife making, a forge welded steel ferrule ensures that food particles cannot become lodged between the tang and the handle. The handle was developed by Mitsuyasu Kawamura (president of Kanetsugu Hamono). His research and study resulted in these light, nimble and perfectly balanced knives. 0.1708984375 0.0927734375 170.8984375 92.7734375 Trailer Started. 0.3115234375 0.140625 311.5234375 140.625 Trailer Completed.